Reverend Theresa Jones, Reverend Julie Humphries and Andrew Simpkins lead the dedication service. Picture by Dickens Heath Parish Council. A WAR memorial has been dedicated in Dickens Heath honouring the fallen. The Memorial Stone, in the village centre was commissioned by Dickens Heath Parish Council to remember those who died in both world wars and following conflicts. The plans for the new memorial have been in the making for five years where a public consultation found residents wanted a modern design for the large new village that replaced the small original hamlet at Dickens Heath. It features a poem written by Alderbrook School pupil Ryan Carter who won a competition lead by Dickens Heath Parish Council. 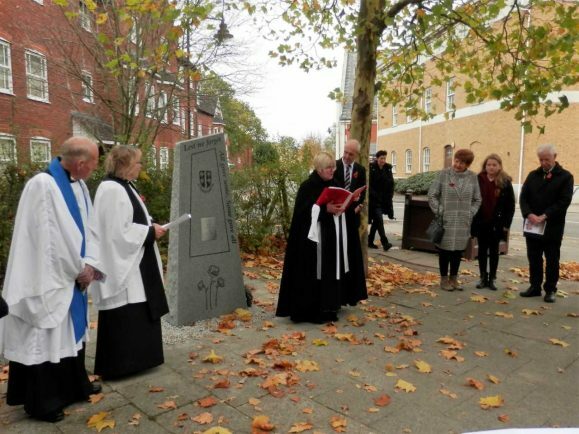 A dedication service was arranged with Parish Church St Patrick’s Church of England on Salter Street and Dickens Heath Community Church. The Service was conducted by Reverend Julie Humphries from St Patrick’s supported by Revd Theresa Jones and Mr Andrew Simpkins from Dickens Heath Community Church. Parish Council Chair Councillor Maureen Holloway said the Parish Council are very please with the Memorial and the contribution it makes at the heart of the village.